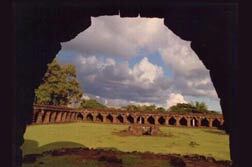 Although called a Fort it is a massive enclosure 172'9" north-south and 253'6" east-west and built of laterite blocks. 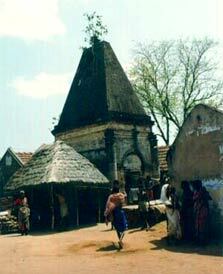 The enclosure contains the ruins of a Siva Temple and a Mosque built by Muhammad Tahir 1691 AD. Entrance on north side and arcade around. 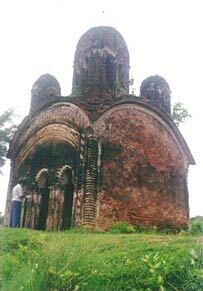 John Pierce who was an ex-collector of Medinipur died here in 1788 AD and the tomb contains his grave. It is located at the south-eastern corner of the Judge Court. 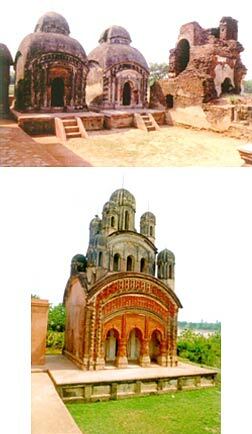 The Navaratna Temple complex include the Navaratna Temple of Majumdar family on the north bank of river Kansai, three other square flat roofed Temples adjacent to it and one atchala brick built Temple of these the famous is the Navaratna Temple built in c.18th cent. AD and having exquisite terracotta ornamentation. 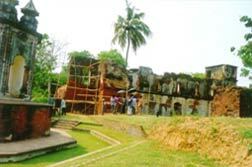 The Kalachand Temple complex situated on the northern side of the river embankment opposite to Navaratna complex, includes the rectangular brick built Dalan type Temple of Kalachand and one rectangular roofless laterite structure fronted by a verandah locally known as Durgamandapa, one brick built half buried Pancharatna Temple just obstructing the embankment, another dilapidated pancharatna Temple at a short distance on the northern side of big tank and few other small Temples. 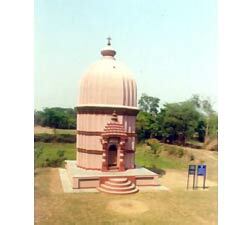 The brick built rekha deul Sitala Temple is believed to be the shrine of the family deity of the Majumdar family and known also as Burimar Than or Sitala Temple. It stands on a high plinth facing the river to its south. The entrance door frame is slightly projected and is embellished with Makara Torana motif. On the back portion two verandahs are noticed. The saptaratha sikhara of the Temple is topped by a round amalaka and Kalasa. This Temple was possible built in the first half of c.18th century AD. The south facing pancharatna Temple is popularly known as Dharmaraja Temple. It is situated just on the northern bank of the Kansai river. The sanctum is fronted by a porch with triple multicusped arched entrances resting on engaged columns. The main Sikhara of the shrine is Saptaratha and corner sikharas are triratha on plan. The ceiling of the sanctum cella is dome shaped and above the verandah it is vaulted. This Temple was built in the 19th century AD.